KIUMC is home to Boy Scout Troop 495! 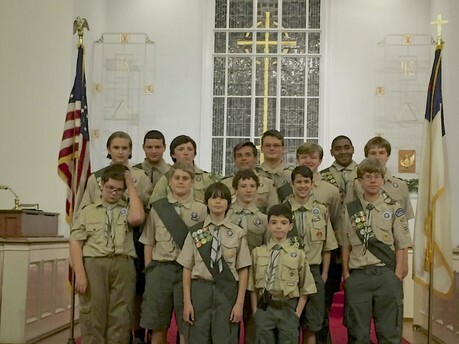 Scoutmaster Dale Cayer leads the troops as they meet every Tuesday evening in the Fellowship Hall at the church from 7:00 p.m. until 8:30 p.m. 495 is a medium sized troop (about 25 registered Scouts), emphasizing a wide range of activities for both younger and older Scouts. We are happy to welcome new Scouts at any time, whether you're bridging from Cub Scouts or have no previous Scouting experience. Scouting is open to all boys from ages 11 to 17, but you need not start at age 11 - you can start at any age! Contact Dale Cayer for more information.